I wanted to put dinner together quickly and thought that I'd simply overcook cauliflower and make a lumpy mash, then mix in seitan. Cauliflower cooks in very little time ("0 minute" - i.e., just getting up to pressure then stopping cooking), but I thought I'd cook for 4 minutes under pressure. Here is what I did. I put the cauliflower, garlic, water, and bouillon cube into my Instant Pot pressure cooker and cooked for 4m. I began, using a potato masher, to mash the cauliflower. I would have succeeded but only after more effort than I had expected, so I transferred the cauliflower to a blender. I added the garlic powder and nutritional yeast, as well as the peeled but not cut shallot, and pulse blended on low-medium for maybe 15 seconds to get a mostly creamy but still slightly chunky consistency. I mixed in, by hand, the seitan. I thought that I would be done and sampled, but the dish needed something else - I came up with the idea of using dill pickle, thinking as well about a potato salad that might include dill pickle. That did the trick! Wow, all of us loved dinner! It came out better than I might have hoped. Just a few days ago, I had advocated for cooking cauliflower waterlessly, but the convenience of the pressure cooker was convincing today. I don't think that the cauliflower softened much from if I had cooked it less; if I'm going to blend, I should try a "zero" or 1 minute cook time. I should experiment with pureeing cauliflower and sauteeing to create a crispy cauliflower cake. I put the navy beans, water, artichoke, and kale into my Instant Pot pressure cooker and cooked for 25m. After the cooking was done, I waited a few minutes and gently released pressure, then added the onion, lime juice, tarragon, and salt. I served with quinoa cooked with carrots, as well as tasty cherry tomatoes with olives. I was interested in watching the first 2016 Presidential debate but my wife wasn't. She and my daughter went out, while I prepared a hearty split pea dinner for myself (and perhaps for lunch for my wife tomorrow) to eat while watching. Here is what I did. I put all of the ingredients except the (italicized) onion, bell pepper, lemon juice, salt, and lemon pepper, into my Instant Pot pressure cooker and cooked for 8m. After the cooking was done, I waited a few minutes and gently released pressure, then added the rest of the ingredients. I served with Jade Pearl rice (cooked in a 1:2 ratio rice:liquid [water and vegan bouillon cube] for 20m, though I could have used less water). I enjoyed dinner. The split peas still had a bit of firmness to them; it was fine, but for a smoother texture, I think a bit more cooking might have been good. I loved the lemon and salt in the dish! A 9 or 10m cook time would have been better. The dish was just barely liquidy - I wonder if I could get away with maybe 1/4 or 1/2 cup less water. Some jalapeno would go well. My daughter and I enjoyed two nights at Colonial Williamsburg and returned last night. I'll share some food notes about our trip at the bottom. For dinner tonight, I thought that I'd use a head of cauliflower. I don't think that I've ever cooked cauliflower waterlessly (in a Saladmaster low temperature stainless steel pan with a vapor release top) before - and ended up with great results. Here is what I did. I put, in order, the onion, garlic, cauliflower, bell pepper, and tempeh into a large Saladmaster stock pot. I turned the heat on medium and covered the pan. When I heard the vapor release start to jiggle, indicating steam coming out of the vegetables, I turned the heat down to low to stop the jiggling and cooked for 20m. I mixed in the seasonings and lemon juice, and served with brown rice. Dinner was surprisingly good; we all enjoyed it. 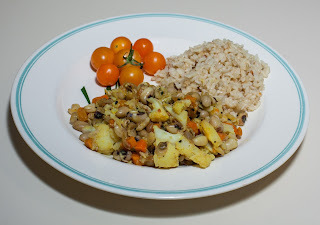 I was impressed with how good waterless cooking of cauliflower turned out, neither soggy nor firm and with flavor intact. The spicing was just right with a little dominance of the fennel taste. I should cook cauliflower waterlessly more often. 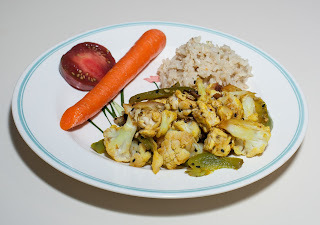 Other techniques of cooking, except perhaps sauteeing, which I've not done except incidentally when the cauliflower is a minor ingredient in a stir fry, seem to sap cauliflower of much of its mild flavor. A little "heat", such as with pieces of jalapeno, might be nice. Other possible ingredients to incorporate could be citrus zest and cabbage. I could have added the spices before cooking to spread their flavors more, but they came out well added at the end this time. Colonial Williamsburg! We had a great trip, enjoying seeing history come alive. We even met a girl (10 years old?) who loves it there so much that she blogs about it. We generally enjoy getting at least good if not great vegan food when we're out. Williamsburg was a bit more challenging for us. We were told that all of the on-site restaurants had vegan options, but found that not to be true. For Wednesday's lunch, we stopped at Chowning's Tavern and were surprised to be told that even their vegetable sandwich had cheese built in. We took their recommendation and walked on to another charming restored tavern, Shields. They also had a vegetable sandwich, but were much more accomodating; they don't have cheese already cooked into the spinach (as the first restaurant said) and, though they weren't sure the bread was vegan, could serve grilled (cooked in a pan and not co-mingled with meat on a grill) vegetables with hummus. The tavern fair was good and it was delightful setting. As we were eating, people dressed in period costumes came through to entertain us. My daughter really wanted to repeat the experience, perhaps at The King's Arms, which staff invited us to. I sure wish that they had more than one dish that they could cobble together. The food itself was good but oily. I enjoy fine dining and feel that any chef, particularly at a good or excellent restaurant, should easily be able to craft an excellent vegan meal. Of course, I wish that all restaurants had significant vegan selections already on their menus. Fine dining restaurants, I would hope, would have at least one fabulous signature vegan dish. I made reservations at the Terrace Room inside their beautiful Williamsburg Inn (rooms for approximately $400-600+ a night!!). Looking online, their menu doesn't appear to have a single vegan option. I had called and they assured me that their Chef could make a fine vegan meal. When we arrived, they had a small page of a vegan menu. None of the few items interested my 7-year-old, and the kind Chef said he could try to accomodate our desires. She wanted pasta and guacamole. I went for a quinoa cake and asked that Chef include beans with her pasta - he immediately kindly asked which kind of beans, and we requested black. Our server brought out good guacamole with fried chips. I asked if the chips were fried with meat, and they were, so were taken back. A few minutes later, the server brought out a great choice, a plate of crispy romaine lettuce. My daughter's pasta was good but oily; it had cubes of carrot along with the beans and looked like it had been cooked in vegetable stock. I liked the small (ditalini?) and chewy pasta tubes. My dish was tasty but, again, a bit too oily. Overall, we enjoyed our dinner - it's great to get out for fine dining in beautiful surroundings (they had a pianist, as well). The food was good and the staff was accomodating (almost all; one server couldn't understand that we didn't want butter or non-vegan bread), but the food wasn't really up to gourmet standards. We've had great experiences at other fine dining restaurants including at resorts such as the creative and tasty dishes that Disney that are readily available. We had a poor lunch on our second day. We didn't have enough time for a tavern meal, though we sought the fun atmosphere. We tried Raleigh Tavern Bake Shop which is a quick service "grab and go" place. I was very disappointed that not even the salads were vegan; they had meat and/or cheese. One of the rolls appeared vegan, and we had it. There literally was nothing else there except for potato chips. We bought their fruit salad that had a carton of cow's milk yogurt in it and returned the yogurt so that it might be used. I apologized to my hungry daughter about chips - she's had potato chips rarely if at all, and didn't much like them. I had a Lärabar to help tide her over. Next time that we visit Colonial Williamsburg, we'll try to arrange things so that we are near Merchants Square just west of the historic district. They have a variety of restaurants that may be good choices (but which I've not explored), such as possibly Aromas World, Seasons, or perhaps pizza at Stephanos Pizza. They also have a farmers' market at times. Further afield in town, I've read that good choices may be had at a variety of restaurants, such as Food for Thought, Istanbul Restaurant, Nawab Indian Cuisine, Lokal, and Chipotle. All in all, we loved visiting Colonial Williamsburg, but sure wish that it might be a bit more accommodating to healthful whole food plant-based dining. The working class of 18th century Colonial Williamsburg typically ate corn hominy and other grain porridges, as well as simple soups, after all. A growing and significant number of people prefer to order vegan foods when eating out. The good food news is that on our drive home, we stopped at Ellwood Thompson's in Richmond, VA, about 45m away and enroute home. It is a good grocery store with a fantastic prepared food bar! They have a sandwich bar with some good vegan choices. We ventured into the salad bar area and initially found a good hot bar with maybe half vegan items, a regular cold salad bar almost entirely vegan, and a raw bar with 1 vegetarian and 2 vegan items. 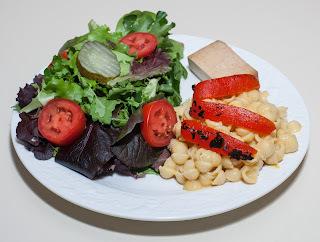 Staff drew our attention to yet another hot bar, all (or almost all) vegan! They even had an extensive set of desserts in their bakery, most of which were vegan! My wife had soaked some black-eyed peas last week and they had mostly sprouted. I was thinking of making a simple saute with onions, black-eyed peas, and cherry tomatoes, but couldn't resist the ease and lack of supervision needed with cooking with my Instant Pot under pressure. Here is what I did. I put all the ingredients except the lemon juice and seasoning into my Instant Pot pressure cooker and cooked for 2 minutes. After the cooking was done, I waited a few minutes and gently released pressure, then added the lemon juice, turmeric, salt, lemon pepper, and sesame seed. I served with brown rice. Dinner came out great - we all loved it. It surpassed my expectations! I figured that the idea of cooked sprouted black-eyed peas would be good. It was seasoned just right with a good citrus base. The texture was great and I made the right decision not to include onion, something that I rarely do. In fact, the dish would be fine with garlic omitted, and then suitable for those who avoid onion and garlic. I wouldn't change anything with this dish. It's fast and easy. I would like to cook with sprouted beans more! My wife is traveling for business so I could make one of my daughter's favorite meals tonight, macaroni and "cheese". We picked up a package of Annie's brand shells and creamy sauce. our favorite brand of boxed macaroni and "cheese" is Daiya's, but I was happy to read that the Annie's one, even with the added soy milk needed to make the sauce, has only 2g of fat per box of 2 1/2 servings - so I can surprisingly claim "almost no added fat" for my serving! I served some baked tofu and a large salad with the macaroni. Dinner was good. 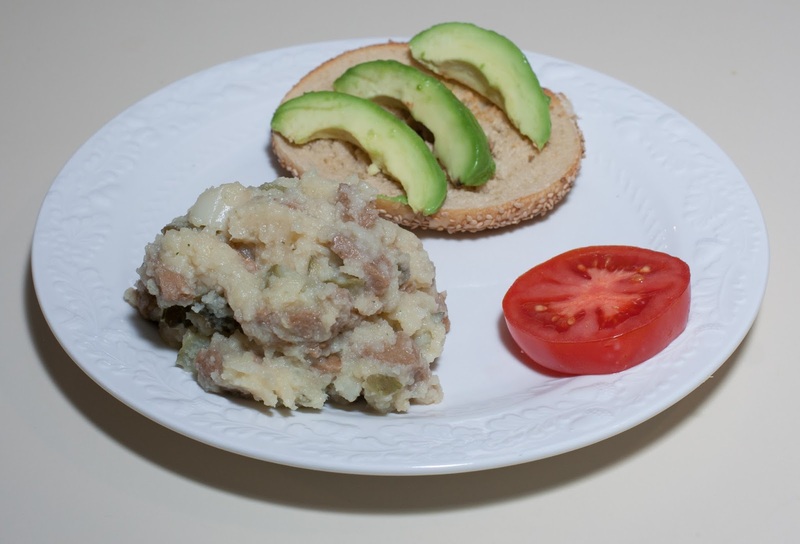 I was thinking of cooking Peruvian giant lima beans with cauliflower. Cauliflower very quickly softens into nice creaminess after just a minute or two of pressure cooking, and my original idea was to cook half of the florets from a head of cauliflower along with the beans for a creamy base, then add the rest at the end, letting them cook just a bit in the heat of the rest of the ingredients. While preparing for the meal, I found that I had some broccoli that needed to be used up, so switched to using broccoli instead for the lightly cooked cauliflower portion, with the benefit of the contrasting color. Here is what I did. I put the beans and water, along with the cauliflower florets, bouillon cube, and garlic, into my Instant Pot pressure cooker and cooked for 28m. After the cooking was done, I waited a few minutes and gently released pressure, then added the broccoli, bell pepper, onion, lime juice, and seasonings. I served along with Jade Pearl rice (simmered for 20m in a 1 part rice to 1 1/2 part water radio and along with a vegan bouillon cube and pinch of salt) and tomato. I came home a bit late and needed to get dinner on the table quickly. Here is what I did. 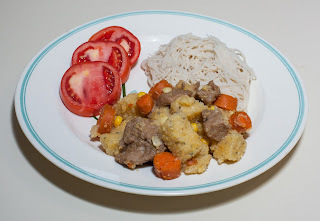 I put all of the ingredients into my Instant Pot pressure cooker and cooked for just 1 minute. After the cooking was done, I waited a few minutes and gently released pressure, then served with noodles. When I was ready to serve, I opened the pot slowly, and added salt. I served with maifun brown rice noodles. Dinner was good. Polenta and seitan make a good combination. I have only once, in June 2014, made polenta from scratch. I was scared off years ago when I read that the stirring can be tricky and can yield lumpy results, but that doesn't seem to be true. I should buy granulated cornmeal and experiment with many more polenta dishes. Greens and/or mushrooms would have gone well with tonight's meal! Last week at a local farmers' market, I picked up a "seminole squash" which seems to more commonly be called a seminole pumpkin. 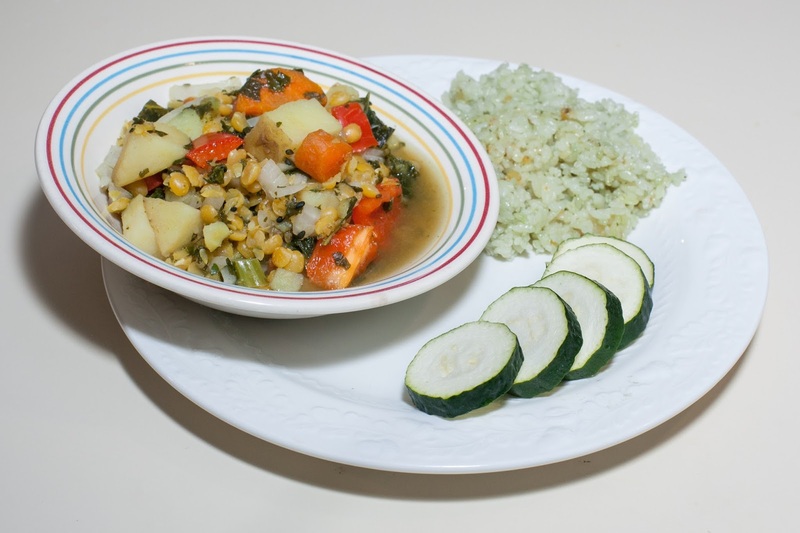 Since February 2015, I have enjoyed the great ease of cooking squash as my friend Lani Muelrath describes by just cooking, intact, with steam in my Instant Pot pressure cooker for 8 minutes. 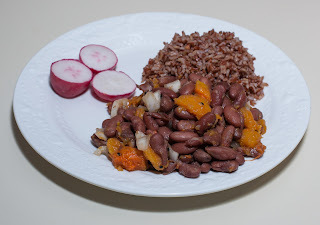 I thought that I'd make a red bean and squash dish. Here is what I did. I was out but had my wife get the beans going by putting them, along with the water to just cover them, into my Instant Pot pressure cooker and pressing the "Bean" button to cook for 30m. In the meantime, I used my second Instant Pot and pressure steamed, for 8 minutes, the two intact pumpkins. I also got some Madagascar Pink Rice going stovetop (in a 1 part to 1 3/4 part water ratio, simmered for 20m with a vegan bouillon cube and a bit of salt). After each of the pressure cookers was done, I waited a few minutes and gently released pressure. I cut the two pumpkins in half and, after a few minutes when I could hold them, I used a tablespoon to remove the seeds. The pumpkin was fairly soft, so I scooped out approximately tablespoon sized pieces, composting both the seeds and skin. I mixed the pumpkin pieces with the beans, salt, cumin, and sesame seed. We all enjoyed dinner. The main course was better than I was expecting - it was tasty and filling. I had considered adding a bit of lemon juice and maybe turmeric to the main course but it really was good as it was. I should do more cooking with beans and cooked vegetables. I cooked for 15m or so then mixed in the seasonings and served with bagel halves topped with warm marinara and nutritional yeast.